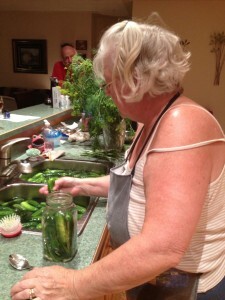 My mother has always made the best dill pickles! Ever since I was little I remember having homemade pickles. I remember going out to the valley in the summertime and picking mountains of cucumbers and how Mom always said I was a ‘good picker’ (which meant I would get in there and pick well and for hours until we were done). I always enjoyed going up to the farmer at the end of our day and weighing the cukes to see how many pounds we had picked. 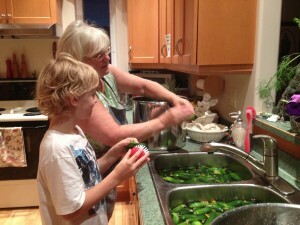 Then we would head home and Mum would get to work pickling the cukes for the yummy pickles that were to come. She made jars and jars of them. At least 80-100 each time, as we would go through a jar of pickles a week in our family. 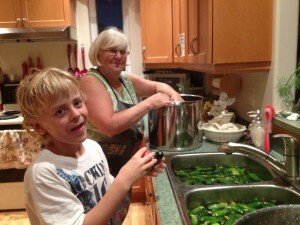 The kitchen was set up industriously, or it seemed so, while my Mum completed all the steps for making pickles. We often had sandwiches or leftovers for dinner during this time as Mum did not want to stop to make dinner! But we didn’t mind and it was what we expected at that time of year. When I first moved away I asked my Mum to make me pickles and send them to me. I had become a pickle snob and I would only eat my Mum’s homemade. I would refuse to buy the ones in the store! 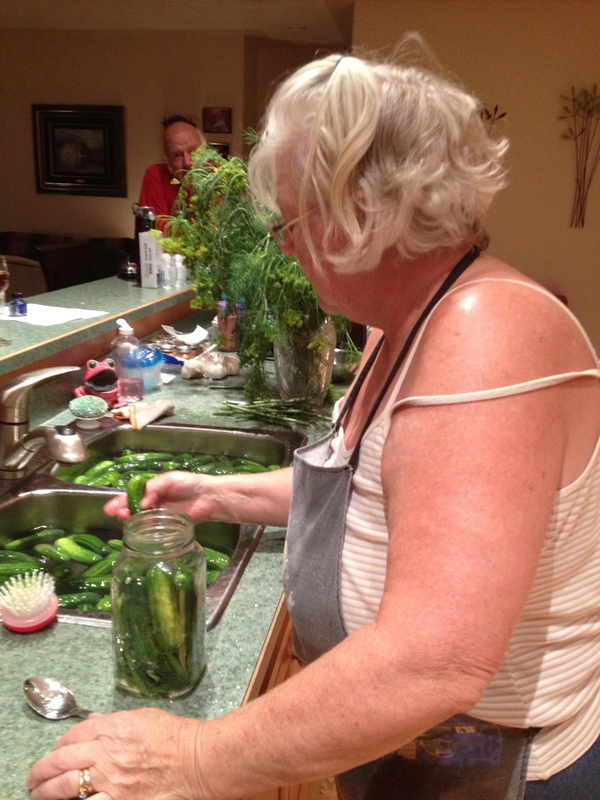 She lovingly did this for a while, but when my parents moved to the Okanagan, it was then the perfect time for her to teach me the art of making the perfect dill pickle. 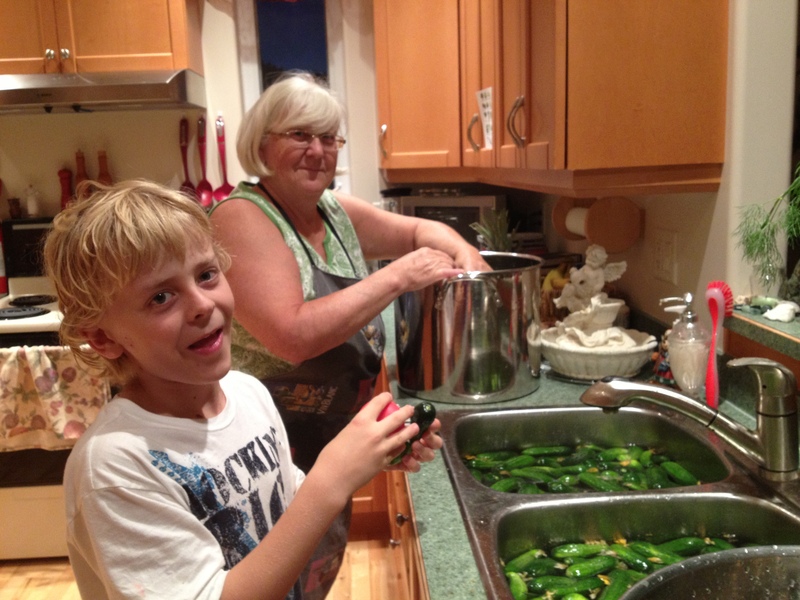 When the pickling cukes were ready she called and I packed up the family and went out to BC to make pickles. 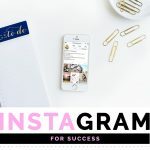 The first time I did it I don’t think I was paying that close attention – (ha ha sorry Mum), but I think I was just so excited to be making my own that the information on what I was doing didn’t stick. 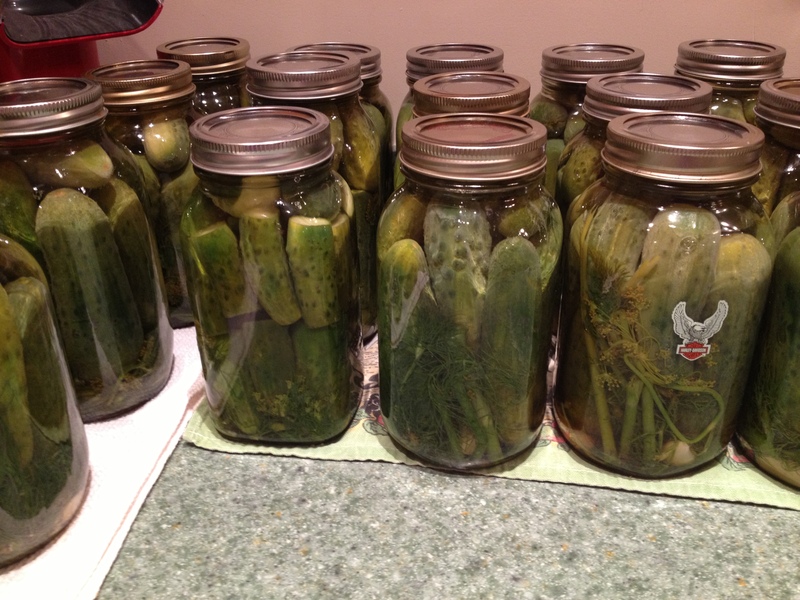 Last summer, when we were out of pickles and I headed to BC once more, was the time that it stuck on what to do. 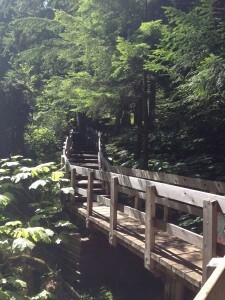 I remember commenting to my mother how many steps there were and I didn’t realize that there were so many. Now I more fully understand why she was in the kitchen for days doing the cucumbers. I had bought 40 lbs of cucumbers, which usually works out to about 40 jars of pickles; and some fresh dill from a local farm in Kelowna. With everything ready to go we set to work. We had soaked the cucumbers during the day so by the evening after supper we were ready to go. Matthew assisted with the cleaning and scrubbing of the cucumbers as that night he was given the option of going to bed or scrubbing cucumbers. He chose the cukes! which I thought was a hilarious way to avoid going to sleep but enjoyed his company and appreciated his help nonetheless. We moved through all the steps and in only a few hours had finished all the jars and were ready to put our feet up and relax. Now the traditional dill pickle recipe does call for a tablespoon of brown sugar, which due to living sugar free I had to make a decision. I decided to leave it as I loved these pickles so much. But what I did do was an experiment. I made a number of jars using coconut sugar in place of the brown sugar, then I marked those jars so I would be able to tell which ones were which. I have yet to open a jar in which we used the coconut sugar, but I am very interested to see how they taste. I am hoping of course that it works, then we can also make our dill pickles sugar free and just as delicious! Of course, once we open them and give them a taste I will definitely share the result! 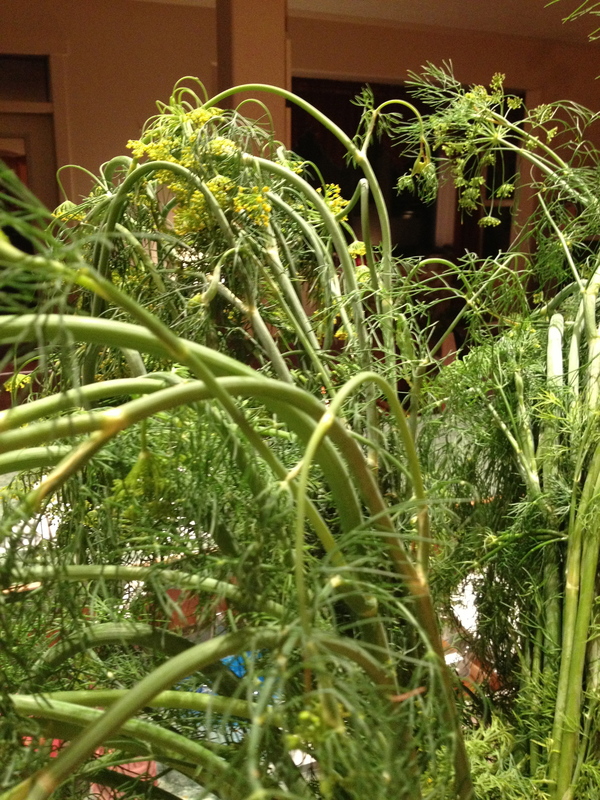 In the meantime, here is the traditional recipe for fabulous homemade dill pickles. One of the things I really enjoy about making them is doing it together with my Mum (and Matthew when he’s wanting to help). 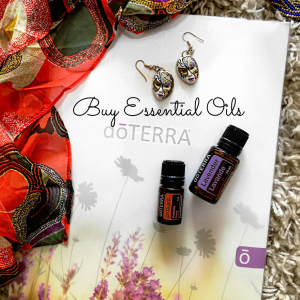 Not only does it make the job go by faster but it is a great bonding experience, where we can chat and connect, while completing the task at hand. 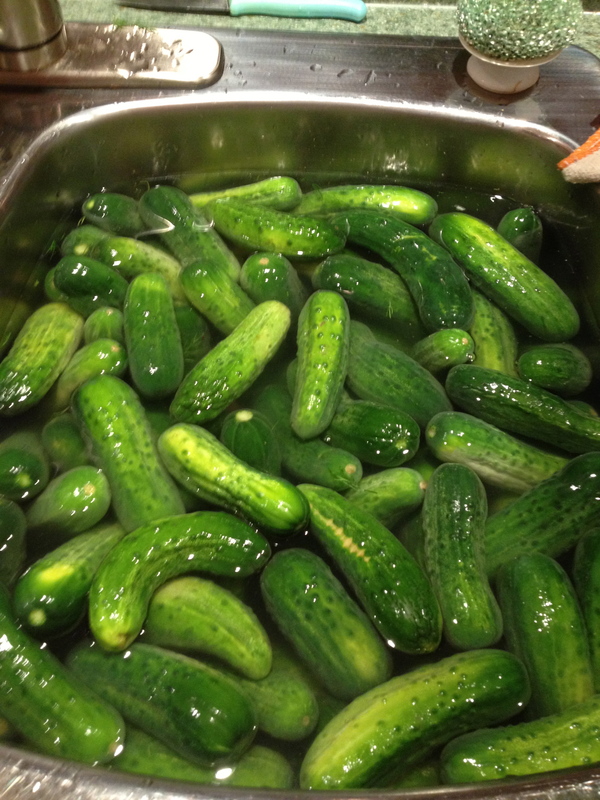 Soak freshly picked cucumbers in ice water overnight or at least, six hours. (This aids in removing the prickles off the cucumber as well as cleansing them). Add more ice, at least once, as water begins to cool. 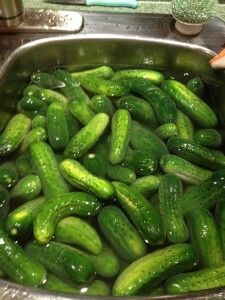 Scrub each cucumber with a vegetable brush, and return to cold water. Wash jars in hot soapy water and rinse well. Then add a bit of water, just to cover the bottom, in each jar. Place the jars on the rack in the oven, heated to 200 F. This will sterilze them and make them hot, which is what you want because you will be pouring hot brine into them. Option: jars can also be heated in the microwave, again bit of water in the bottom of each jar and heat on high for 2-3 minutes; time varies depending on the number of jars you do at one time. Place the lids and tops of the jars in a pot filled with water to cover them and heat to the boiling point. Turn down heat, but keep them hot to pack the jars. For each 4 cups of water, add 3/4 cups of pickling vinegar. The total amount you make will depend on how many jars of pickles you are making. 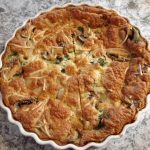 Using a large dutch oven pot you can make a triple batch, and then more as needed. Mix water and pickling vinegar together and bring to a boil. Keep hot until ready to pour into packed jars. Put about 3 medium size pieces of garlic in bottom of jar. 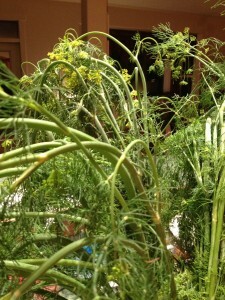 Add fresh dill, approx 2-3 “sprays” including the stalk. Bend and arrange to fit in jar. 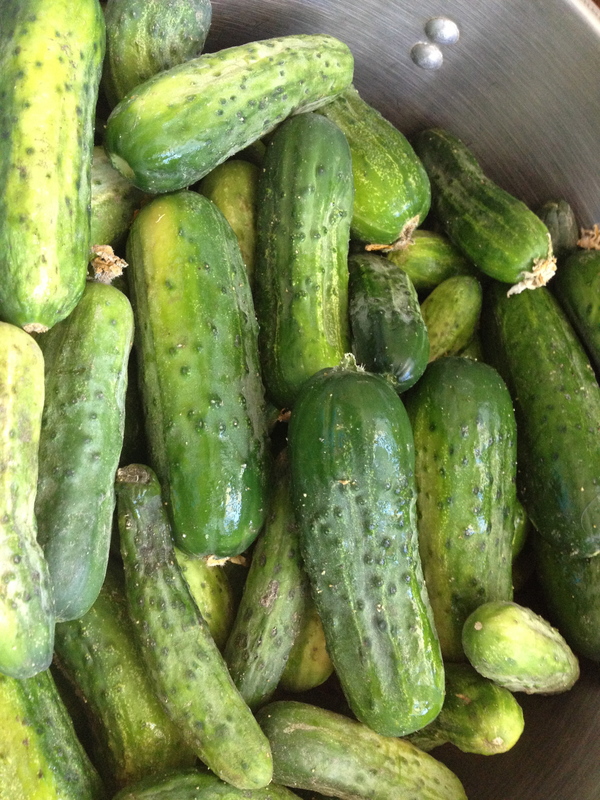 Pack cucumbers in jar, quite tightly, using smaller cucumbers to fill the top space. Add 1 tbsp of pickling salt and 1 tbsp of brown sugar or coconut sugar on top of packed cucumbers. Pour hot brine over everything in jar to just below the rim of jar. Wipe the top of the jar with a cloth to make sure there are no particles of anything to interfere with the seal. Place hot lid on top. Add screw top. Press down on lid as you are turning the screw top to seal. Tighten securely. Let stand, away from drafts until jar cools completely. Label and store in cool, dark place. It will be approx eight weeks minimum before pickles will be ready to eat. Best if left for 3-4 months. Bonding with my oldest son is a bit of a challenge these days. He’s 11 and into all kinds of things that are not a huge interest to me. I’m 41 and his Mom, so there are not a lot of things that I like that are of interest to him. We do have some common ground of course, we both love board games, especially Settlers of Catan, so you will often find us in the evenings battling it out for the longest road and the most settlements. Sometimes it’s a timing thing to, I’m making supper, or having to tend to his younger brother and sister. So when we had the opportunity to go to Sky Trek in Revelstoke, British Columbia to do the high ropes course; I jumped all over it. 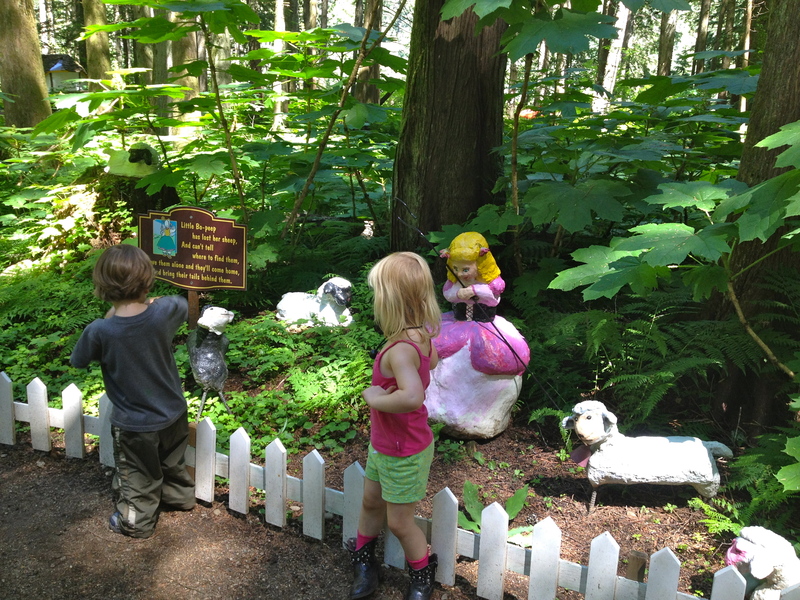 We had been to the Enchanted Forest next door earlier that morning with my Mom and the twins, which we thoroughly enjoyed. But Matthew and I were both kind of eyeing the course through the trees. I had always wanted to go there since they opened and though Matthew had had the opportunity when he was about 5 to do the kids course, he wanted to get up high in the trees. So when Matthew asked about the course I said well let’s go check it out. His eyes lit up, he was so excited with just the prospect of ‘maybe’ going. 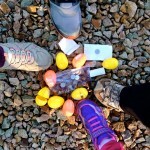 We discovered that the course took 1-3 hours to complete and though reasonably priced we wondered what Gran and the twins would do for that long. My Mom graciously offered to watch the twins while we went and did the course. So after a quick lunch, off we went! I grabbed my closed toed shoes from the car, which I was glad I had thrown in that morning, as there are no open toed or flip flops allowed. Though I wish I had also had the foresight to put in socks, which would have been much more comfortable. Matthew and I were both excited and almost ran up to the clerk to get going. First of course we had to fill out waivers, then pay, then meet our guide to get geared up and ready to go. 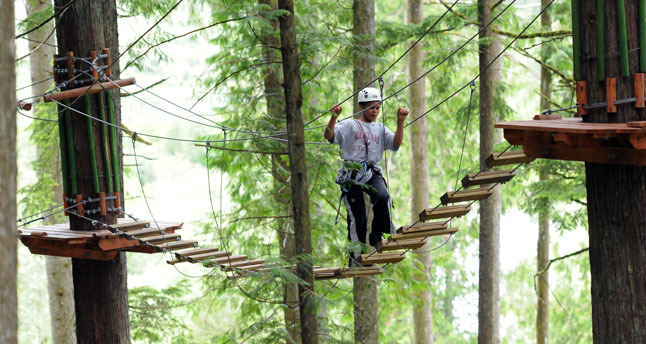 The course consists of 4 components, each one getting higher and more difficult as you go. Training is first, where your guide gives you a demonstration of the elements and obstacles, what equipment to use and how to keep yourself strapped in and safe. We all had helmets, harnesses and carabiners. We had 2 that we needed to clip in and each had to be done in a certain way in a certain order. He showed us how to use our zipline attachment as well as telling us only 3 people to a platform and to remember to call clear after we completed an element – which was the cue for the next person to go. Then there’s the green, blue and black courses, each one getting higher and more difficult as you go. 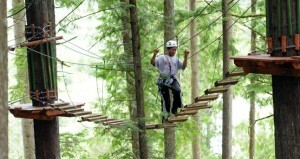 So by the time you hit the black course you are 40 feet in the air and challenged! Matthew went first and I was following along behind him. 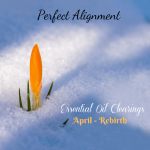 At points when we were waiting for others in front of us we would chat or connect, discussing the last element or what was coming up; continually moving higher and higher. I found the first 3 parts comfortable and easy to navigate, but by the time I hit the black I was not only tired but a little freaked out. Some of the elements were pretty tricky and they definitely pushed my comfort zone. The very last leg of the black course you could choose to do the double black diamond or stay on the single. The double black offering shorter lengths, more rests, but more challenging (lots of swinging obstacles), while the single black was one long haul across a rope net, which was more tiring but a lot easier to do. Matthew, the trooper, chose the double black. In fact in his mind there was no question as to whether he would do it or not. I applauded him, but said I was going to stick to the single. Matthew did very well, I was so proud of him. The last leg on the double black he was there legs spread apart between two triangle elements, and ‘resting’. I could tell he was tired, but he was almost there and he was determined. It was one of many moments that I was proud of him or maybe got a little teary eyed watching him and how he confidently navigated the course, though at times I knew he was a little freaked out like I was. We completed the course with one final zip line to the bottom and high fived each other on the ground. We were surprised to discover that it had indeed taken us 3 hours to complete the course. No wonder we were tired! And thirsty! as you can’t take water or any extra stuff up there with you. In fact I asked a lady on the ground if she would take a few photos of us and send them to me (unfortunately I don’t have them yet), as though there were times when I could have taken a really nice picture or two, there was no way I would have been able to carry the camera! 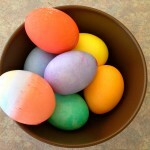 Some people may argue that because it was an individual activity that it was not really a bonding experience. But I would disagree. 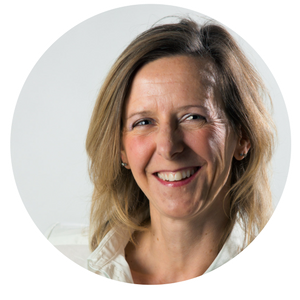 We connected and shared an experience where we both pushed our limits and can now share and discuss this experience. I also have etched in my mind some of those great ‘shots’ of him in the trees which will last forever in my mind. 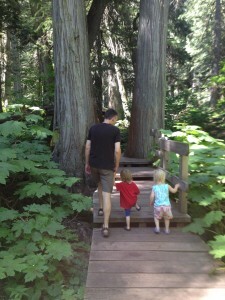 I enjoy experiences like that with my kids and hope I get to have all kinds with each one of them. And I hope that they enjoy them to and that they will stand out in their minds as some of the best experiences they had, even though it was with Mom. One of the most magical places on earth is The Enchanted Forest. 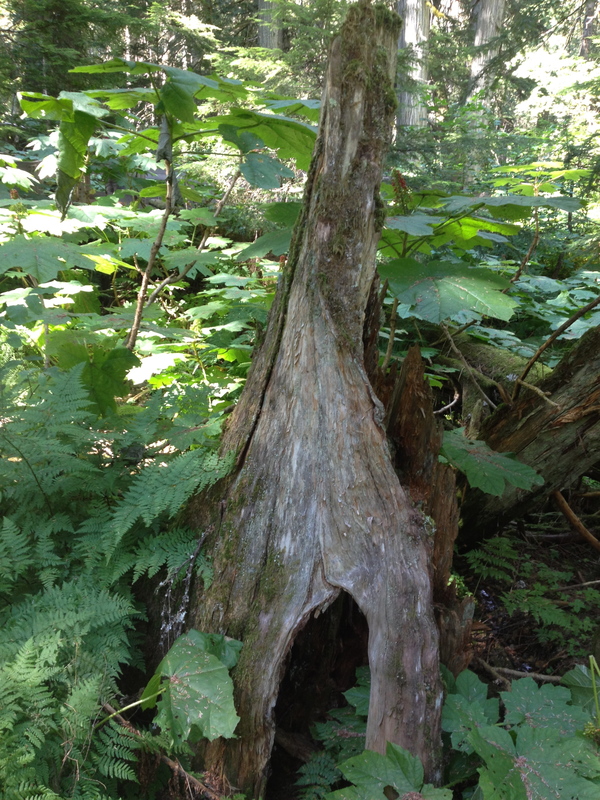 Found along the TransCanada highway between Revelstoke and Sicamous, this beautiful old growth forest is like a child’s dream. No matter how many times I there I always enjoy it. 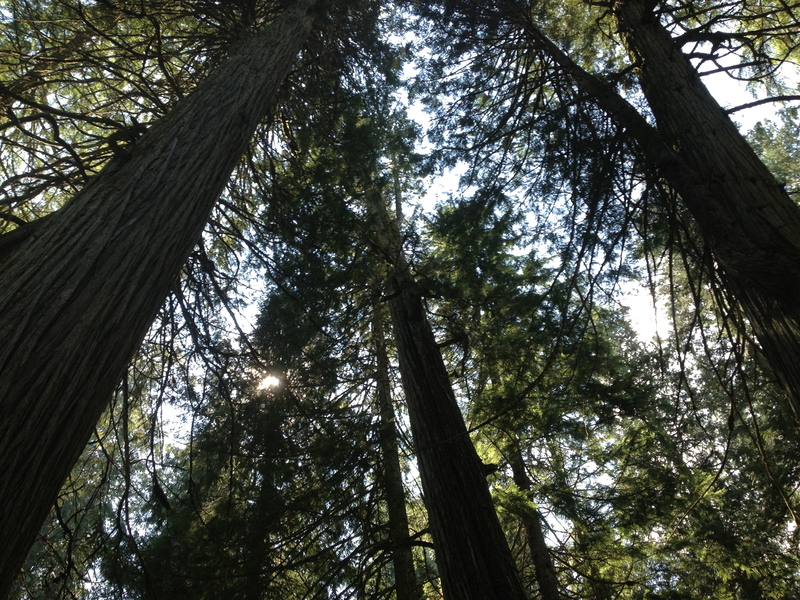 The beauty and energy of the old growth forest is calming and peaceful. With the delightful storybook and nursery rhyme characters in amongst the trees it truly makes for a magical and wonderful experience. 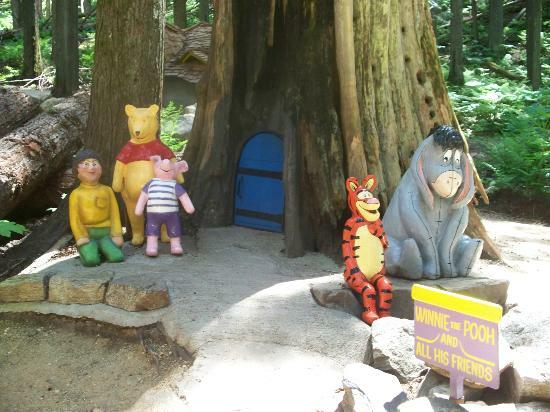 It is a must stop for our family and every time we drive by on the way to Oliver, BC the kids are asking if we can stop there. This summer was the first time for Luke and Chloe. Being 4 years old this was the perfect age for their first experience. 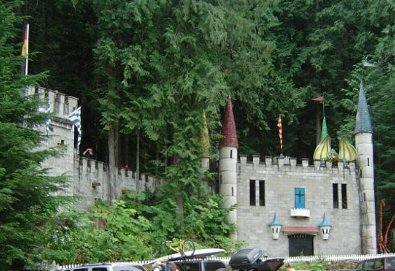 Once you enter your first stop is the Enchanted Castle where the resident wizard welcomes you. You can clamp yourself in the gallows (or any misbehaving children) or explore the dungeons below. Word of caution: the dungeons I find to be dark and scary and definitely not for small children. You can climb the stairs to the tower and enjoy being ‘King of the Castle’, before you continue along the path through the forest. 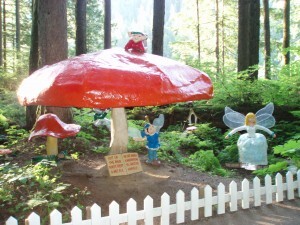 The path then takes you around the forest with stops along the way to play and enjoy the fairytale characters. There is everything from the Three Little Pigs, Snow White, and Winnie the Pooh, to Hansel and Gretel, Old Mother Hubbard and the Cow that Jumped over the Moon. 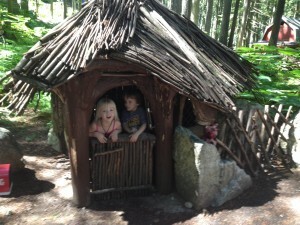 The forest also hosts the biggest Tree house in British Columbia, with 3 levels and a gorgeous view at the top. 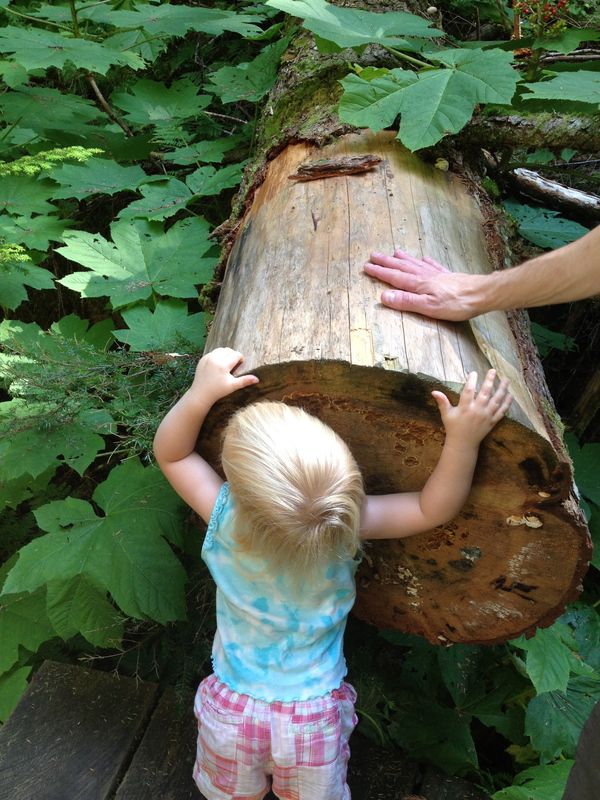 There is also a Nature Trail which takes you back further onto the property with opportunities to see beaver dams, row boats and explore other nature items. 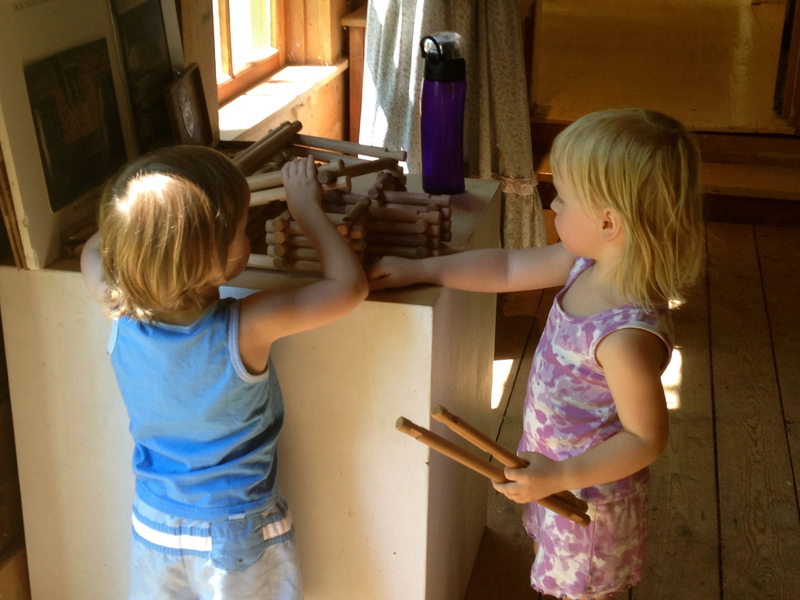 Luke and Chloe dashed and explored everything. 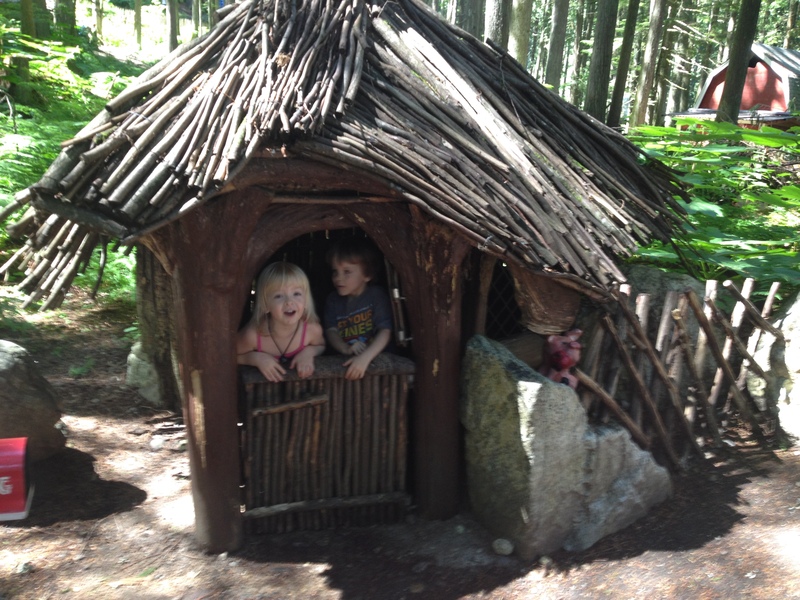 Checking out the houses, which are just the right size for 4 year olds, going down the slide at the Old Lady in the Shoe’s house and enjoying the cage at the witches house (Hansel and Gretel). 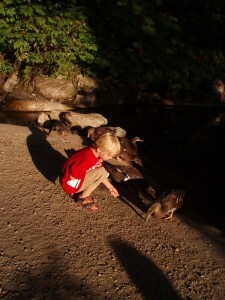 At the end of the trail there is a duck pond where you can buy duck food for 25 cents to feed the ducks. You can easily spend a couple of hours in there and not feel rushed. The great thing is once you’ve paid your admission you can return to the forest throughout the day if you choose to. We went through it twice and they wanted to go a third! 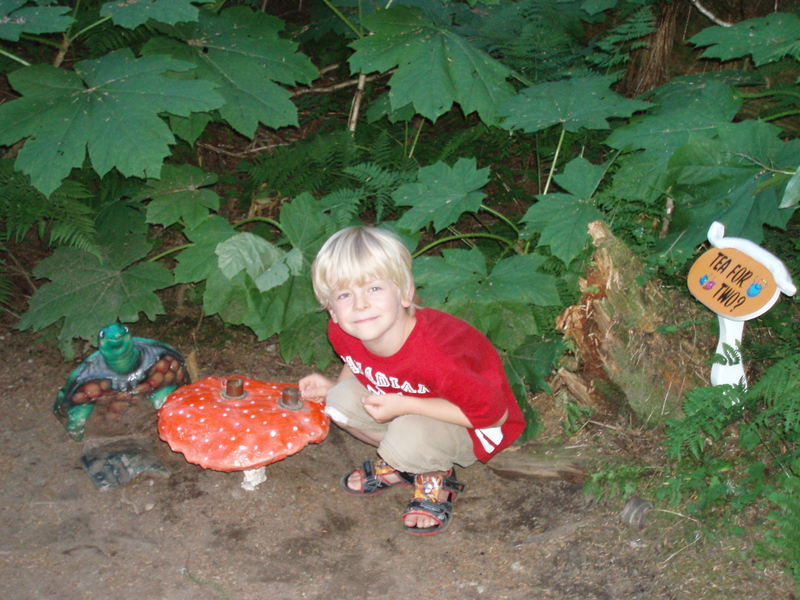 Even my oldest who is almost 11, and has gone many times, still enjoys exploring here. Whether you are exploring the Revelstoke area or just passing through, the Enchanted Forest is a must see for all ages, children and adults alike. Often times on road trips I look for a nice little place to stop along the way. I feel that the journey along the way can be just as much fun as the destination. In fact we often find/ discover little treasures or places to explore that we might not otherwise. This was the case on our way back from Oliver this summer as it was about that time to stop and stretch our legs, as I always like to make sure we do so at least once. It not only breaks up the drive but gives everyone a nice break to look forward to. 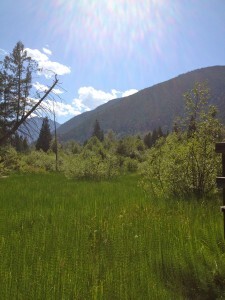 We were coming up to the Skunk Cabbage Trail which is in Mount Revelstoke National Park. I was starting to feel tired and Luke and Chloe who had been sitting so well for the whole trip, needed to get out and move a bit. 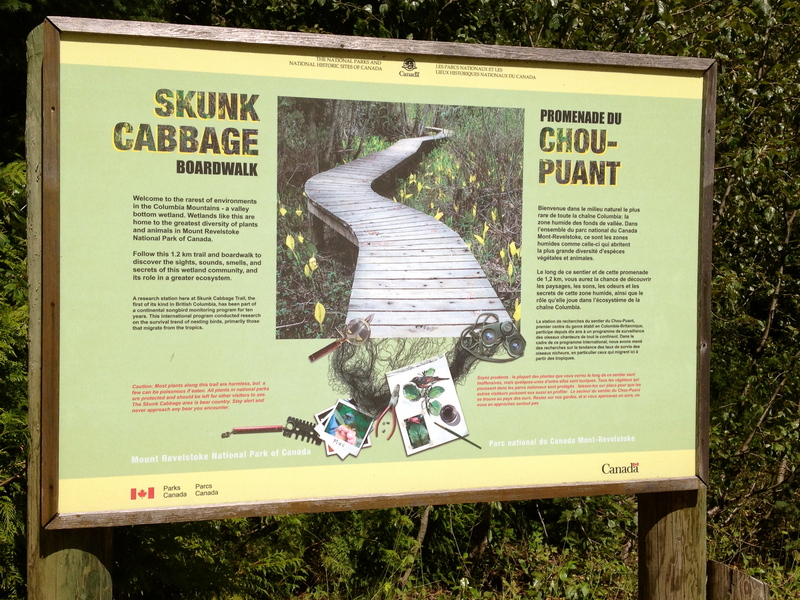 When I told them that we were going to stop and go for a walk on the Skunk Cabbage trail they got very excited and chatted about it excitedly until we got there. I had been on this trail before with my oldest son Matthew when he was about 3 years old and this was one of my favorite trails. Luke and Chloe had never been and I knew that it was a short loop they could easily handle. The 1.2 km loop is a valley bottom wetland – one of the rarest environments found in the Columbia Wetlands and is full of Skunk Cabbage, a plant that is found in wetland areas and has a beautiful yellow flower in the spring. 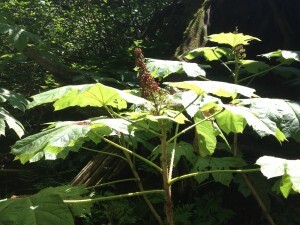 It is called Skunk Cabbage because of the distinctive ‘skunky’ odor it emits. 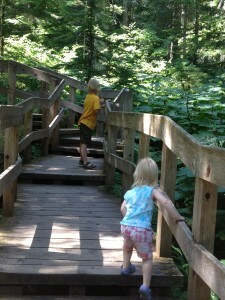 We set off along the trail, crossing a wooden bridge over a rushing creek. 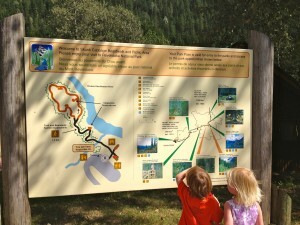 Luke and Chloe stopped to check out the sight leaning through the rail, saying “Mommy look water!”. We could have stayed there watching the water for awhile, going no further and Luke and Chloe would have been totally satisified. 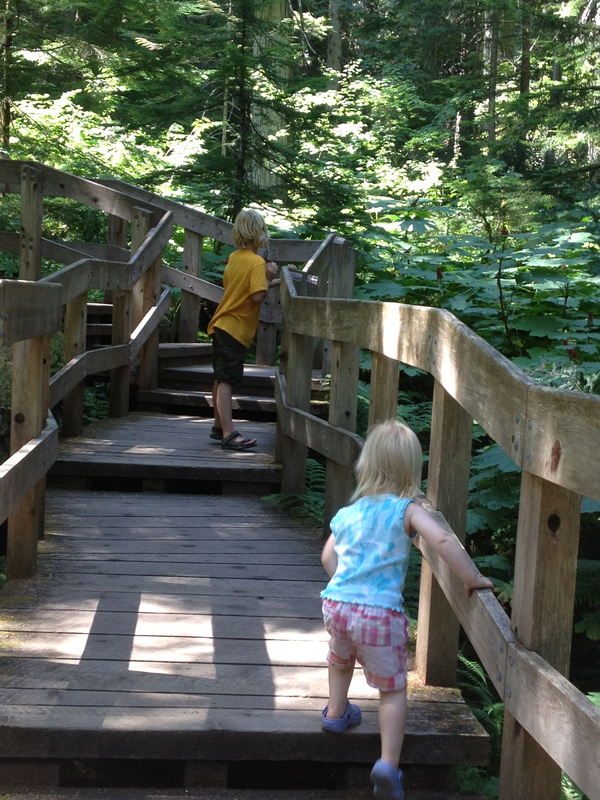 But me, being a typical mother wanted to move on as I not only wanted to walk the trail but was concerned about them falling over the railing into the water – ha ha. 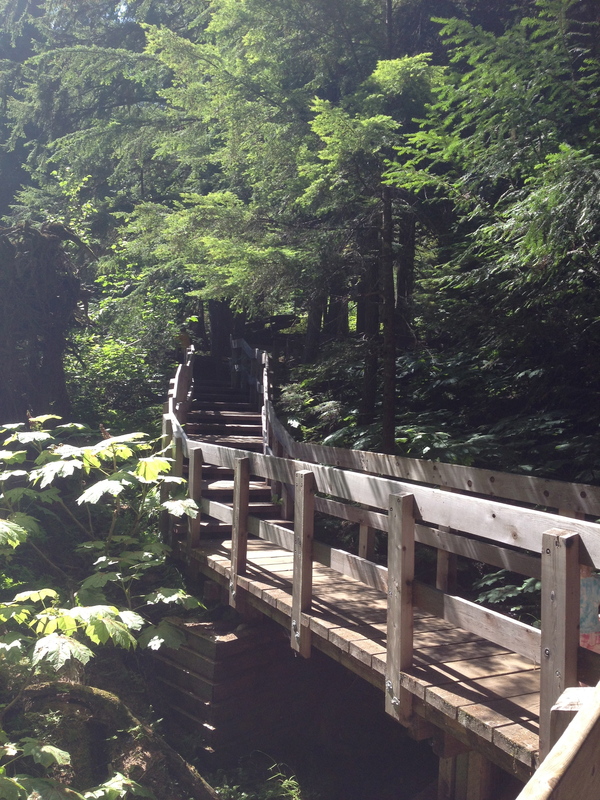 On the other side of the bridge we entered into a cool old growth forest making our way to the beginning of the boardwalk itself. Interpretive signs highlighting the rich diversity of the plants and animals found in this area were spaced out along the loop. We would stop at each sign and I would ask Luke and Chloe if they wanted me to read it to them and they always said yes. So we learned about the bird migration project they were doing, that black bears like to eat Skunk Cabbage and other plants and animals such as Devils’ Club and frogs. It was a hot afternoon and I was glad that it was only a short walk. The kids had their water cups with them while I had left mine in the car. We took our time, stopped to rest and enjoyed the trail. Luke kept asking where the skunks were, as that is what he thought we were looking for. 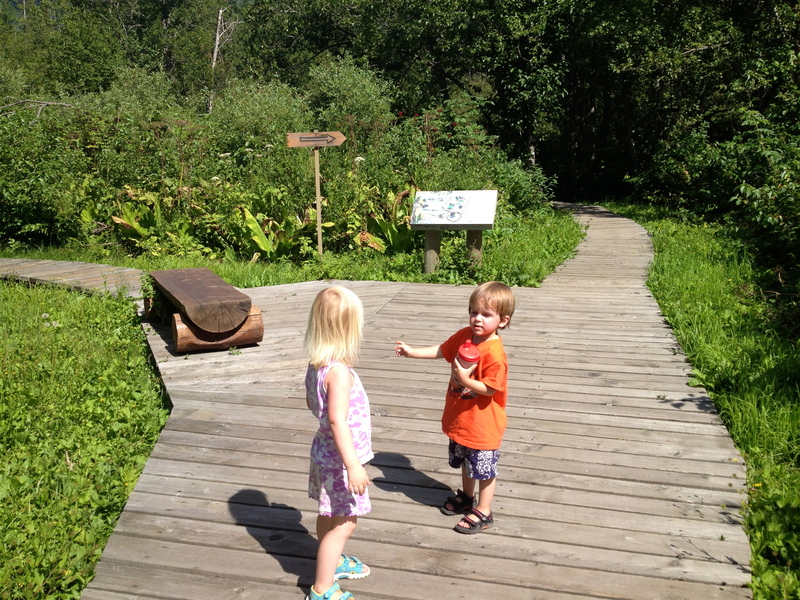 I explained to him that it was a skunk plant and not an actual skunk and kept pointing them out along the trail. Chloe caught on quickly and started to point out the plants as well. Luke was still asking about the skunks by the time we got back to the car but enjoyed his walk none the less. 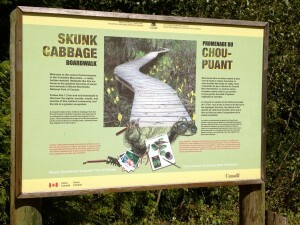 Though we did this walk in the summer, you could still easily do it in the Fall and if you have the chance I would definitely recommend it in the spring; as that is when the Skunk Cabbage flowers and it is a very cool sight to see – these huge plants with big yellow flowers in the middle. A lot of people have commented that they like my photos, that they always turn out so nicely. I would like to think that when I take a picture that I capture something that’s going on. So it might not always be a group shot with everyone smiling and looking at the camera, though those are definitely nice too, but ones where there’s an activity or a conversation going on. Where you look at the picture and can find something to discuss or surmise just by looking at it. This summer when we were in Oliver visiting my parents we spent many days relaxing at the lake or playing at the waterpark. Sometimes my parents would come along and hang out though both of them are not really water people. 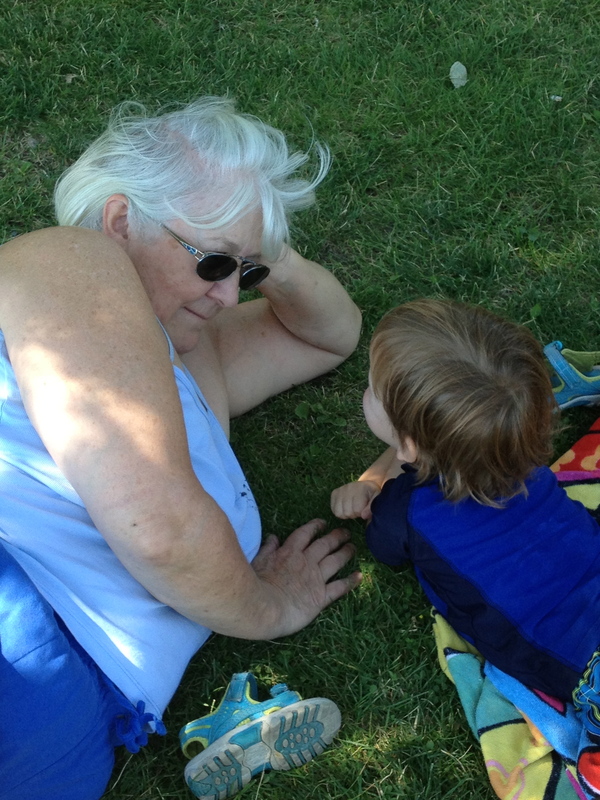 In this shot of Luke and my Mom, we were at the waterpark and my Mum had just laid down on the grass in the shade to hang and watch the kids with me. Seeing this Luke promptly walked over and laid down right beside her. It was so cute. They didn’t really have a conversation just sat there changing positions (as Luke would copy my Mum when she did) and looking at each other. Luke was quite content to just hang out with Gran; which is something that I think we can all benefit from, literally just hanging out with someone we love and care about. Where ‘being’ with them is all that we need. I love those neat little gem discoveries that we make by accident on our travels and in our lives. 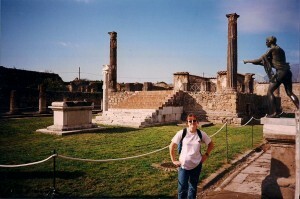 Places that you did not know of or intend to go but somehow ended up there. This happened to my mother and I when we were in Italy. We were in Naples planning to go to Orvieto the next day but when we checked the train schedule discovered the train left at night so we had a whole other day there. 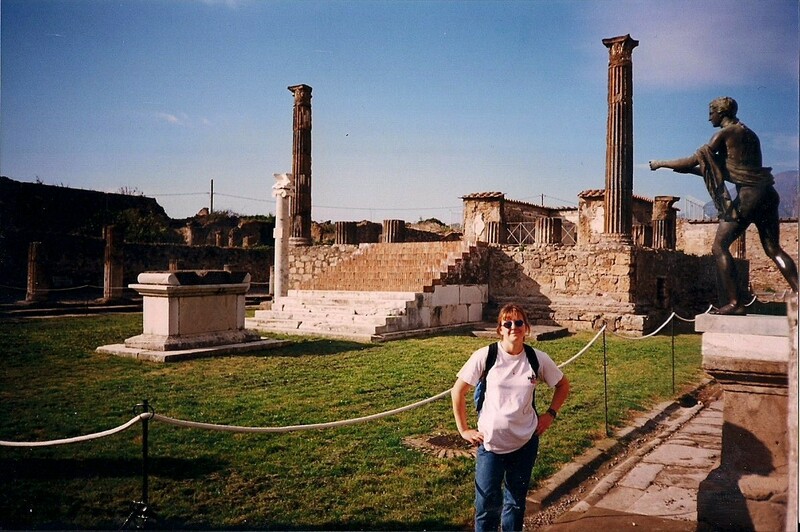 That’s when we looked around and discovered Pompei was not very far and could easily be done during the day and then catch our evening train. For me that was one of the best parts of our trip. 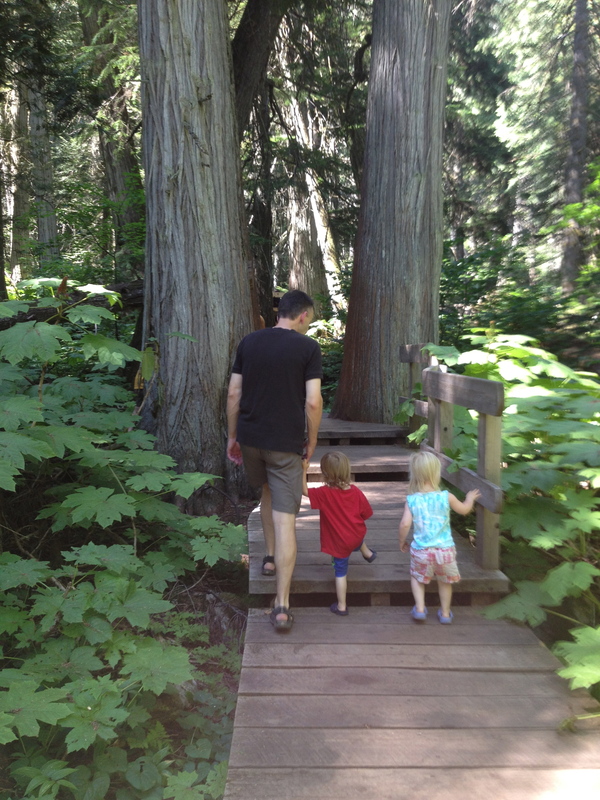 This happened again recently for my family this summer when we were out in British Columbia visiting my folks. 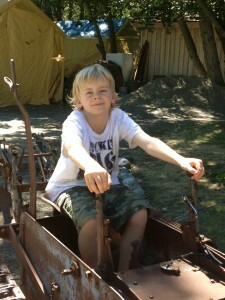 I had always wanted to take the kids out to Farmer John’s Petting Zoo in Keremeos but the timing had never worked out. So this one particular day I told them we were going to pet some animals and off we went; only to discover when we got there that it no longer existed and the farm was for sale 🙁 (Thankfully Luke and Chloe were not too upset and just kept looking for the animals). 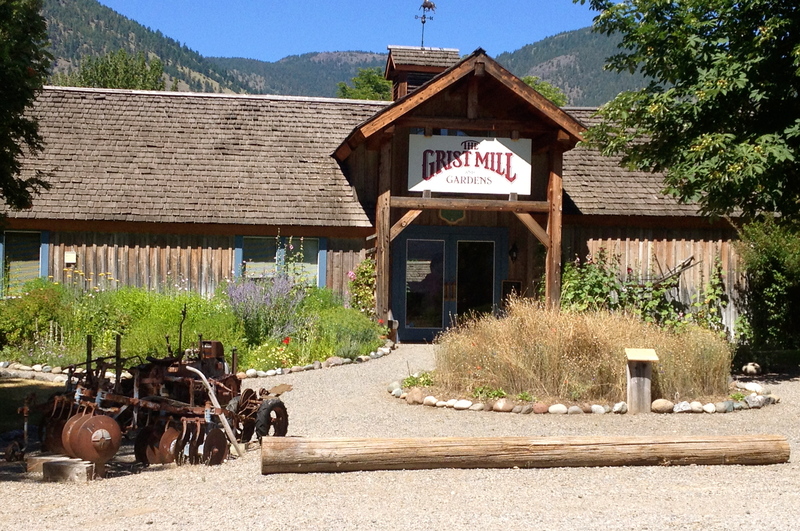 But as we were traveling up and down Upper Bench Road looking for the farm, I noticed a Provincial Heritage site called the Grist Mill and Gardens. So not to waste our trip to Keremeos and in the spirit of an adventure we went to check out the Grist Mill. 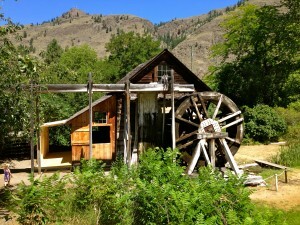 The Grist Mill is an actual old flour mill rebuilt from 1877. The grounds include not only the mill, but beautiful gardens, tea room and gift shop as well as some other replicated buildings from that time. It is a an educational family fun site in a beautiful setting along a creek, with an apple orchard and walking paths. The site also has picnic tables for those who wish to bring their own and enjoy it out in the gardens. There is a small admission fee to the site. The kids were very excited and interested in what there was to see. They were lots of hands on interactive things that they could do and before we were even in the door Matthew found an old tractor that he could sit on and maneuver. 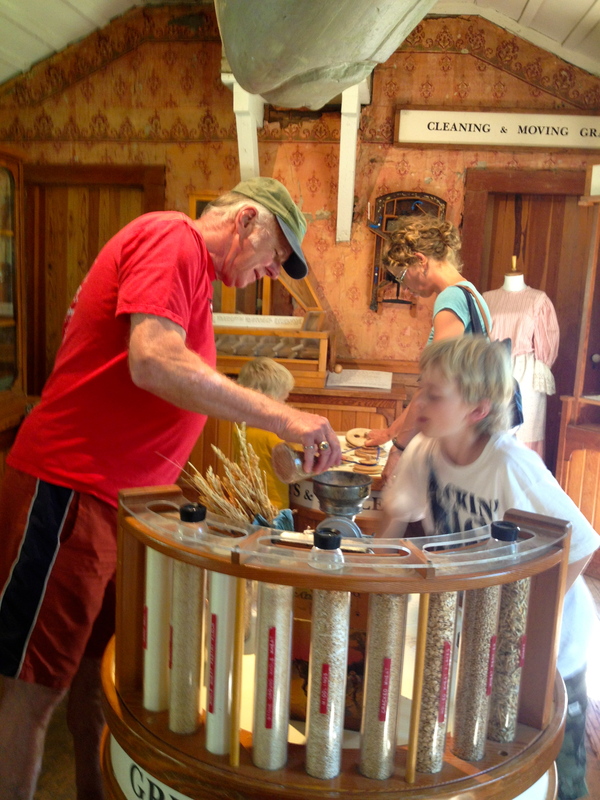 Inside the General Store, was an area where they could look at and ‘process’ different kinds of grain, as well as a log cabin to build. 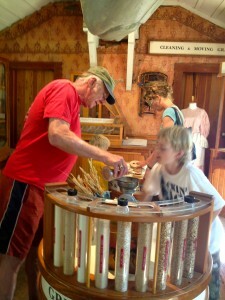 Luke and Chloe loved the cabin building and Matthew and Grandpa thoroughly enjoyed processing the wheat and making it into flour (as Matthew got to grind and then sift the flour). The tour of the actual flour mill was fascinating, with a demonstration of how everything worked. It was interesting to see how the waterwheel worked and how much work it took to actually produce a small amount of flour. I would not have wanted to do that job! 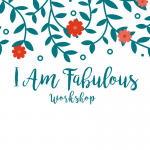 With such beautiful grounds they also offer various workshops and events such as watercolor, evening concerts and guest speakers. A very rich and beautiful spot literally tucked away, but totally worth going to! So Luke and Chloe did not get to see the animals as I had promised, though we did see a couple of Llamas, but we all enjoyed our little adventure and learned a little something too! Though we were there in the summer they are still open into the Fall and it would make a great Fall outing. 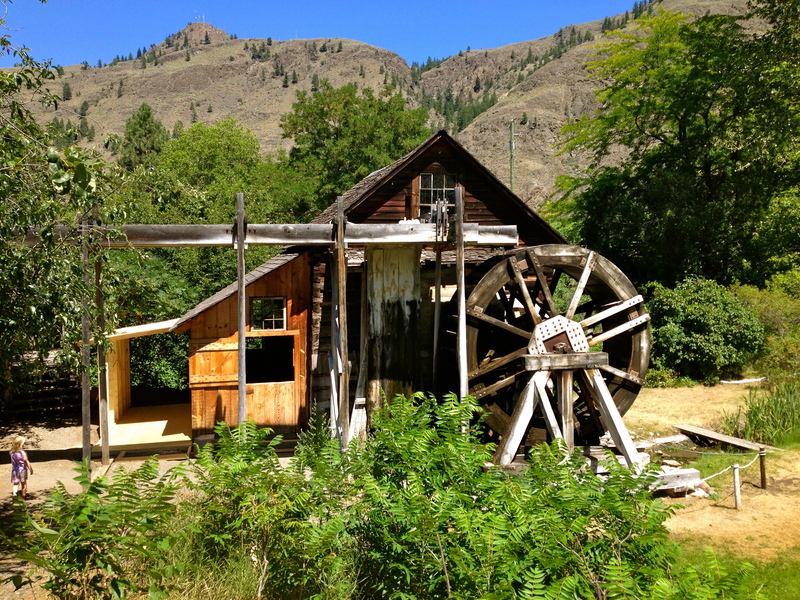 So if you’re in the Keremeos area before Thanksgiving it’s worth going off the road a bit to discover this little gem. 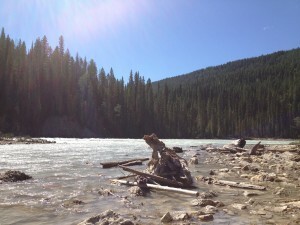 On the weekend that Matthew and I did the Burgess Shale hike (read more in earlier post) we also did a few shorter hikes the following day. We did this for a few reasons, one was that Matthew was up bouncing around and had some energy to burn (yes after 22 km the previous day, he was neither tired, nor sore) and I also felt it was a good idea to move a little and do a short hike so we wouldn’t stiffen up. Not that Matthew would. Plus I love going and exploring. 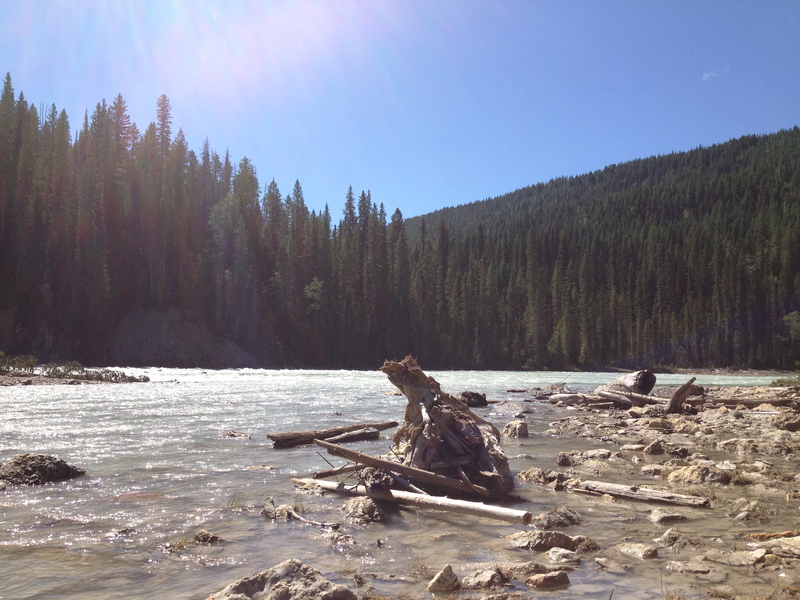 We’re often driving through Yoho National Park on our way to somewhere else and don’t make any stops to check things out. So as I’m driving through I mentally make a list of places/ hikes I would like to go and see for the time that we do stop and stay awhile. Wapta Falls is an easy 5 km return hike in Yoho National Park in British Columbia, along a treed path to a beautiful waterfall at the end. Though fairly flat, the trail ends in a slight incline to get to the falls but is a great trail for beginner hikers and for kids. 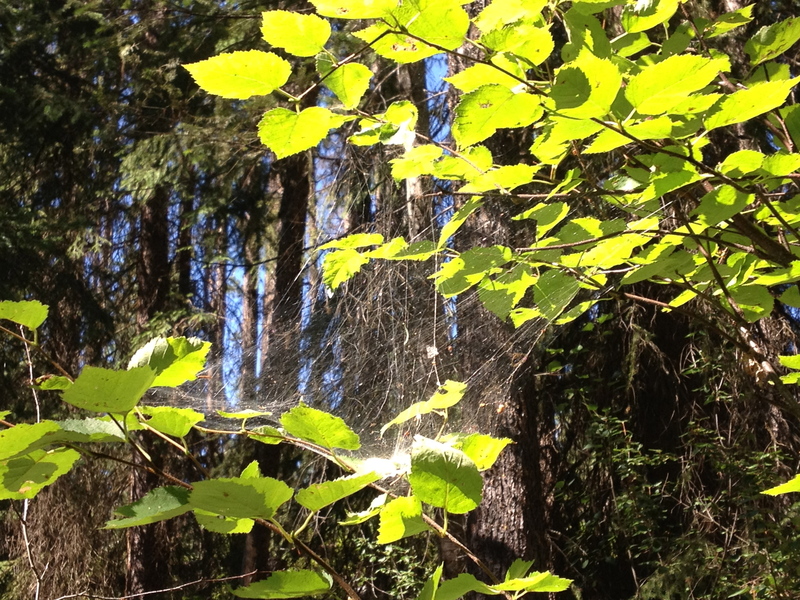 There are lots of things to explore and discover along the way; we found a beautiful spider web between the branches of a tree and an interesting bump on another tree. 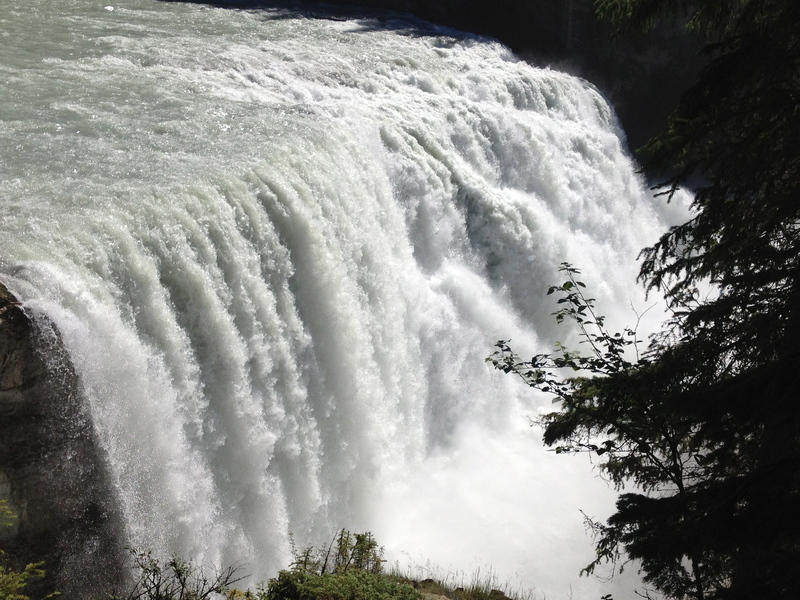 Of course there is the anticipation of the falls at the end, which as you are hiking along the path, can hear before you actually see it. Drawing you, beckoning you. Though the trail is suitable for children, it is not suitable for strollers. 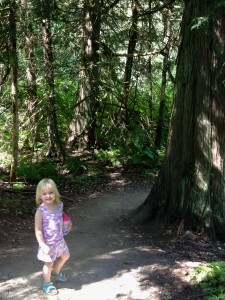 There are bumps and tree roots along the way that make it quite difficult to navigate a stroller on it. If the children are not walking on their own then I would recommend one of those backpack carriers for small children. 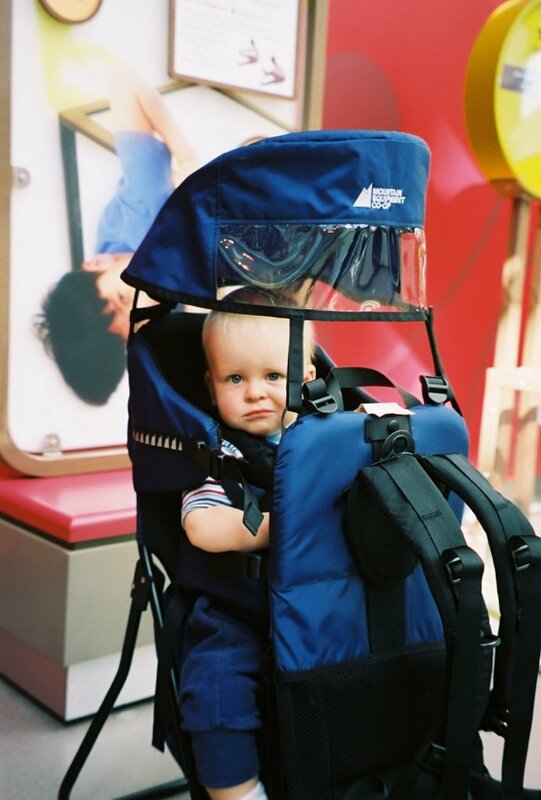 There are many different styles and brands out there, we have one from Mountain Equipment Coop we really like, as well as one from Baby Trend. 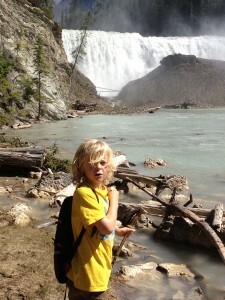 Matthew practically ran down the trail and we had to ask him a few times to slow down, or pause to take a break. The rush of the waterfall was drawing him in and he was getting excited! There are 3 spots where you can look at the falls. It is a bit deceiving when you first come to the falls as it looks like that is where the trail ends. There is a fenced area overlooking the falls with a bench to sit and relax. A lot of people assume that this is where the trail ends but if you continue down the trail, you can go off to the left for a different view or continue all the way to the bottom. If you go all the way to the bottom, the trail ends by coming out onto a beach along the river at the bottom of the falls. 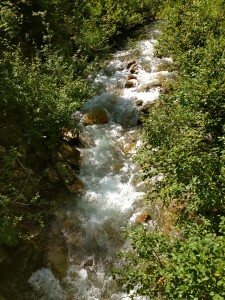 It is a great place to sit and just be, soaking up the beauty and absorbing yourself in this calm, peaceful environment. 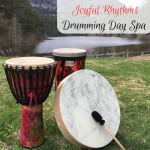 The kids will love playing in the sand or throwing rocks into the water, or you can even move down along the shore a little ways and continue to explore. It’s a lovely spot to sit and have a snack or enjoy your lunch as you gaze at the waterfalls. 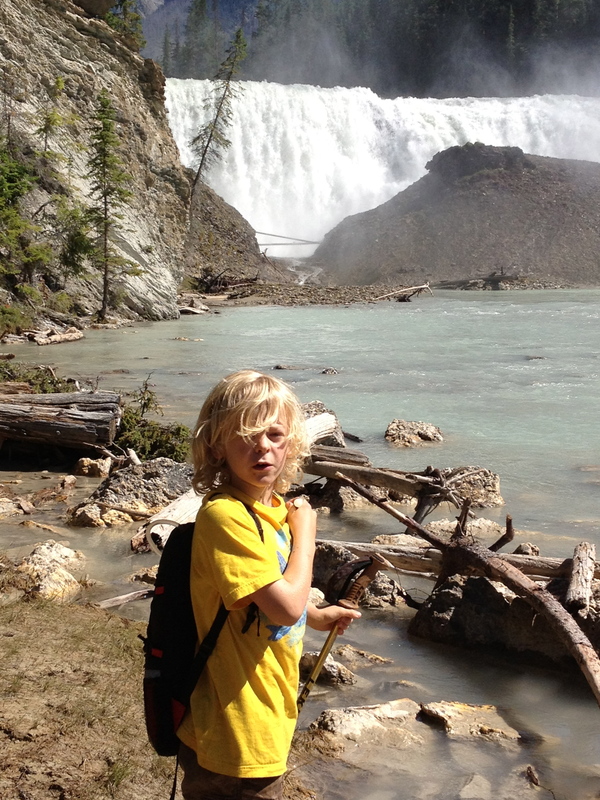 After spending some time at the falls we hiked out, Matthew again running – oh to have the energy of a child, and enjoyed some nice relaxing quiet time back at the campsite. Well I did, Matthew on the other hand was busy as usual, chopping wood.